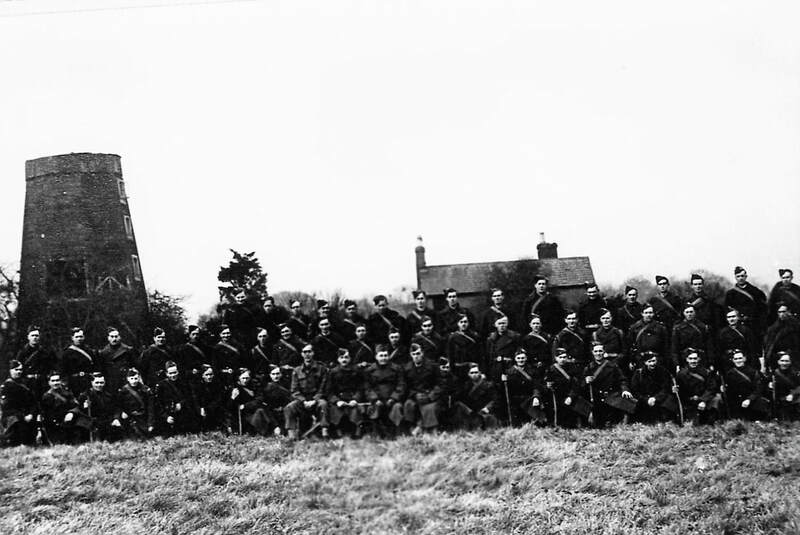 At the outbreak of war, Local Defence Volunteer (later Home Guard) platoons were formed in each of the local villages, each having its own signing-up venue. Bradleys, Thurlows, Wrattings, Cowlinge and Withersfield platoons formed part of 'B' division. Captain Percy Smith of Mill Farm, Great Bradley, was in charge of 'B' division, and Lt. Skevington was officer-in-charge of Bradley platoon. Marion Smith lived at Ickworth Park and remembers this being a busy military area with soldiers billeted under canvas in the park. Her knowledge of war-time Bradley was through her late husband, Ron, who lived at Mill Farm. One of the front rooms at Mill Farm was used as a meeting place and a storeroom for Home Guard Equipment. There was a Home Guard hut near the ford at the bottom of Water Lane, and Marion's mother-in-law used to spend considerable time 'fire-watching' from this, presumably looking out for aircraft activity. Jimmy Tulloch (Wratting) was 'B' division Company Sergeant Major and was concerned with training as senior NCO, Much of the initial training was carried out by the London Irish Rifle regiment, which was billeted in the Haverhill and District area. Mock attacks on Stradishall aerodrome featured as part of the training for the Home Guard and local knowledge of farm workers enabled the Home Guard to approach Stradishall without using roads. To prove that they had gained access to Stradishall, white chalk marks were left on buildings within the aerodrome. Jimmy Tulloch considers that Home Guard training benefited men who subsequently joined the regular army. He himself joined the regulars in 1944 and rose to the rank of Captain. After the threat of invasion had passed, the Home Guard continued to meet, but the benefit to local landlords rose considerably! Bill (Doody) Chapman, Gordon Chapman, Cecil James Crick, Jack Felton, Jim Gladwin, Ted Grimwood, William Kemp, Horace Martin, Archie Mills, Bert Mills, Charles Mills, Jim Mills, Kitchener (Kitch) Mills, Percy Mills, Reginald Mills, William Mills, Jim Nichols, Ernie Phillips, Micky Reed, Barney Smith, Clem Smith, Tom Smith, Fred Stafford, George Sumdge, Danny Webb, Ernie Wimpress. (the above list may be incomplete as it proved impossible to recall and name all Home Guard members 50 years on).
" I have never seen the picture of the Home Guard and it contains many names from my family: Percy, Charlie, Archie, Reginald (Sam) and my father Kitch Mills. His actual name was Harold Kitchener Mills. He never used the Harold, I guess because of an older brother, Harry, who was farm manager at Wodgells Farm. Fred Stafford and Ernie Wimpress were married respectively to my Aunts Inda and Ethel - whether the other Mills's were also brothers I do not know (they were prone to using nicknames), and one may be my uncle 'Nip'. William may have been his son, my cousin Billy. The WWI Roll of Honour, lists my father's older brothers, Charlie, Alfred (referred to by my father as Fatty although photographs show him as wirey - who was awarded the Military Medal in WW1) and his eldest brother William, my uncle Billy. All were in Kitcheners Army either when father was born, in Sept 1914 or before his baptism, hence his middle name and why he was always called Kitch. My mother was Florence Helen Cambridge daughter of a Fishmonger in Crystal Palace. She was known as Floss to her family in London, but this was too posh a name for a country girl and she became known as Helen in Suffolk. She was a Milliner in a West End Store who joined The Land Army and lodged with Mrs Stanley at Fox Farm House in the village. Mrs Stanley was mother in law to Mr Custerson the Farmer. When my parents married their first home was the small round house at Little Bradley."